SAS® Base Certification Exam Prep Workshop trains the Business Analysis professionals to write SAS® programs, build proficiency in data manipulation techniques and subsequently succeed in attaining the certification - SAS® Certified Base Programmer for SAS® 9. 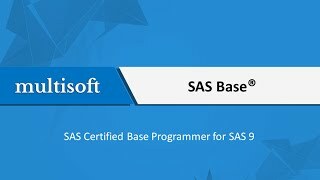 SAS® Certified Base Programmer for SAS® 9course includes two books â€“ SAS®Programming 1: Essentials and SAS® Programming 2: Data Manipulation Techniques. Participants learn how to navigate the SAS® windowing environment; read various types of data into SAS® data sets; enhance listing and summary reports; and combine and validate SAS® data sets. This Base SAS® certification and training program additionally imparts the skills required to control SAS® data set input and output; perform DO loop and SAS® array processing; andtransform character, numeric, and date variables. After completing the SAS® Certified Base Programmer for SAS® 9 course, candidates can work as SAS® Developers, Business Analysts, ETL Specialists, Securities Analysts and Statisticians. Successfully completing the SAS® Certified Base Programmer for SAS® 9 certification makes participants eligible for the Advanced SAS® Programmer Certification. After attending SAS® Base Online Training, you will be prepared to appear for the SAS® Certified Base Programmer for SAS®Version 9 certification exam. How do I become SAS® Base certified? If analytics and data have been your interest, getting started with SAS® Base is the most appropriate route. Enroll in the Multisoft SAS® online training of SAS® Certified Base Programmer for SAS® 9 and get 24 hrs live Online Training and access to high quality course content. What are the prerequisites for taking the SAS® Base Certification exam? The course is appropriate for individuals with a logical bent of mind and skills in statistics coupled with an interest in Data science. There are not any stipulated or defined prerequisites to join the course. Evolved to be an expedient career choice today, the SAS® program is appropriate for candidates with a high interest quotient in Data Mining and Predictive Analysis. Individuals who have a keen interest in Business Analytics and Data Mining and want to make a career in Data Manipulation techniques can consider taking up SAS®. Although there are some exams which retire as new software is developed, SAS® Global Certification Program now issues versioned credentials that do not expire. For instance, if you earn SAS® Certified Base Programmer for SAS® 9 credential, you can retain the credential. Why is the certification highly in demand? McKinsey Global Institute has predicted that by 2018, Unites States alone would face a severe shortage of 140,000 to 190,000 professionals with deep analytical skills. NASSCOM has predicted this number to be 2, 50,000 for India by 2015. As per the Gartner’s recent research, a total of 4.4 million analytics jobs would be created by 2015 globally making Data Analytics and Research to be the second most demanded professional quotient. Harvard simply calls it “Sexiest Job of 21st Century”. What are the career prospects after gaining SAS® Base credential? As per Indeed.com, Data Scientists earn an average of $97,000 and have been widely in demand across all Fortune 500 companies. Having this coveted credential would help you to secure a niche amongst the competition along with providing the professional recognition in the domain. Check out Why do you need to have SAS® certification for a Data Analysis role? to get an idea. What is SAS® Base programing for SAS® 9 exam like? It is a 60-65 multiple-choice and short answers-type questions based 110 minutes duration exam, aimed to test an individual’s analytical skills. The questions assess the candidates in the fields of logical reasoning, Data Analytics, Generating Reports and Handling Errors. A candidate has to secure atleast 70% marks to clear the certification. What is the exam fee for SAS® Base? For candidates registering in North America and India, the fees associated with the SAS® Base exam offered by Pearson VEU is USD 180. This fee can differ in different countries and additional taxes may apply. Please visit www.pearsonvue.com/sas for exam pricing in your country. Are there any sample questions available for SAS® Base? You can try the Sample Assessment for SAS® Base here. By enrolling in the Training program developed to prepare the candidates for the SAS® Base Global Certification, you get access to high quality course content along with real time assessments and mock tests. You can also request a free Mock Test to get started with. Each certification exam can be attempted up to five (5) times in a 12-month period, waiting a minimum of 14 days between attempts. Exam charges are incurred for each exam attempt. Although no further attempts are allowed on the exam once a passing score is achieved on the specific one. How can I register for the SAS® Base exam? The admission procedure for SAS® Base Examination with Pearson VUE starts with creating id which includes your photo id and digital signature. The photograph and signature will become a permanent part of each candidate’s certification record. Instructions to register for a SAS® certification exam with Pearson VUE are available within the Exam Registration tab. If you are a first-time registrant for SAS® Global Certification exams, you will need to create a web account within Pearson VUE. This can take up to two business days to produce your username and password needed. Registration with Pearson VUE may be made online or by phone only. Pearson VUE authorized test centers cannot take registrations at their locations. How can I prepare for the SAS® Base exam? The ideal path would be to enroll in a training program like Multisoft Virtual Academy’s SAS® Base Exam Preparation Workshop which aims to build the skills in the required domain. It is highly recommended to opt for an institute which focuses on real time analysis and provides industry focused training. Take this Sample assessment and check how prepared you are to take the exam. Click here. Multisoft Virtual Academy’s SAS® online training of SAS® Certified Base Programmer for SAS® 9 is ideal for candidates with aspirations in Data Analytics. Apart from equipping the learners with the basic of data manipulation and predictive modeling, the training aims to prepare the candidates for the certification exams. What does the SAS® Base Online Training offer? The course is a 24 hours instructor-led online training which aims to build the necessary skills in a learner to crack the certification exam. For working professionals, the institute provides the option of flexible schedules and on demand training making it feasible for everyone. There are weekend as well as weekday batches available. Instructor-led online classes can also be customized. This means the schedule you fix is a mutually convenient one and you can also set what pace suits you if you are studying one-on-one. Apart from the online training sessions, access to course content is provided and the subscription comes with 18 online assessments and 3 mock tests to practice to perfection and build the confidence to take the SAS® Base exam. What are the chief features of the SAS® Base program? Multisoft Virtual Academy has specifically prepared the Base SAS® course to help individuals achieve the associated certification. This course provides knowledge about core SAS® concepts; guides you on how to prepare for the exam; and imparts you in-depth in the area of Data Analysis. What are the core benefits of SAS® Base Online Training? To make sure that the candidates clear the exam in the first attempt, the institute provides loads of experience. Upon enrollment, learners get access to 18 online assessments and 3 Mock Tests to aid the participants in their learning journey. The exhaustive question bank is based on real time cases and helps build the confidence to take up the certification exam. These exams are time based and you can take them through LMS. After completion of a test, the candidate gets to know the correct answers along with the graphical representation of the individual performance. Data and Analytics have evolved to be a quite lucrative career option. Apart from SAS® Base, SAS® Advanced; Big Data and Hadoop can be found influential with myriad of job opportunities across industries. You can browse the list of programs at Multisoft Virtual Academy and choose your choice of programs. What are my options after SAS® Base Certification? After gaining SAS® Base certification, you can take your knowledge further with SAS® Advanced Online Training by Multisoft Virtual Academy. Professionals who want to build a strong career in Data Prediction and Manipulation can undergo SAS® Advanced Online Training after which they eligible for SAS® Advanced certification exam. Who is the instructor of SAS® Base online Training at Multisoft Virtual Academy? Is the trainer certified? Yes, the trainer is SAS® certified and holds years of industry expertise. He has trained diversified leaders and is acknowledged for his teaching acumen and knowledge base. He also has hands-on exposure of 4 years which is clearly visible in the quality training and support he provides to the students. Check his profile here. The candidates can easily make the online payment through the course page. The fees is listed on the page, click the ENROLL button and you will be taken to the payment gateway. The course fee as listed is only for the SAS® Base Online training. Multisoft provides you the certified notes and knowledge enrichment to help the candidates prepare for SAS® Base certification, for which you have to schedule and pay the fee on the parent website. It is a third party transaction and the candidate has to make it himself. Will Multisoft provide me the SAS® Base Certification? Multisoft provides Training certificate to the students who successfully complete the 24 hours online training with the institute. For gaining the coveted credential, you have to register and pass the SAS® Certified Base Programmer for SAS® 9 certification exam. 24/7 Learning: Multisoft provides you an access to it Learning Management System that hosts all the CBAP learning and course material. The access is 24/7. Read testimonials to know why Multisoft is the most preferred Training provider amongst the professionals globally. If you are willing to upgrade your knowledge quotient, Multisoft is there for you. We provide the option of flexible schedules for all the programs. For working professionals, there is an ease of learning through recorded sessions and 24/7 access to learning resources.